Yes, Richard, I’ve seen it in America. & England. In my experience they are the SuperBowls Craptacular, the much ado about nothing Oscars night, the weekly tele-evangelists/the Crystal Cathedral & the occasional Christian Rock concerts. Now, these people may be delusional, they may be brainwashed, and the government & clergies are definitely screwing them but the future is bright….cause soon the clouds will part and mount Olive shall split in two and a New Jerusalem shall descend from heaven. In other words, a one world western government rule. No, I was just kidding. I agree many of these events are pretty crap, especially if they have westerners/Africans doing chinese style stand up comedies, yikes….only in China, indeed. Oh Mah God. Richard, I’ve been to one of these, at the Shanghai International Film Festival in 1993. It defied description. youguys, the Superbowl comparison is somewhat apt, though the halftime extravaganza is infinitely shorter. Actually what the Superbowl reminds me of is that New Years TV show in China – the one that’s on CCTV – in that everyone watches it. What a lot of people don’t understand, and part of the point Richard makes here, is that China pre-“Economic Miracle” was incredibly bleak. I was there in ’79, immediately after the CR. Peoples’ lives were rigidly controlled in nearly every aspect. What they wore, what they ate, where they worked, whom they married, where they lived. You could associate with foreigners on some days, on other days you couldn’t. You were watched, constantly. Everyone reported on everyone else. The degree of personal freedom that most Chinese enjoy now was unimaginable in 1979. I’m not talking about political freedom or poverty or corruption or any of those things. Just the ability to make basic decisions about your own life. That’s not to deny the huge and very deep problems with the current “economic miracle.” Anyone who’s followed my own postings over the years knows that the environmental crisis is a particular concern of mine. It not only threatens China’s economic growth, it threatens the health of its citizens and of the planet as a whole. What happens as these bills continue to become due is anyone’s guess. Great post, Richard … except for the very American comment about the people having been given hope “by the freedom of free enterprise”. It may be true to an extent, but the rampant excesses of free enterprise have actually served to impoverish as many Chinese as they has helped. Well, Mainland Chinese certainly know how to have a good time, however kitsch the means by which they achieve this. Thanks Lisa – as usual, you said it best. youguys, I’m not sure I’d call the Oscars craptacular. About the Superbowl, I can’t say as I’ve never seen it. Are there really any US entertainment evens where there are four uninterrupted hours of schlock music and dancing? At the Oscars they show a lot of movie clips and throw in a s*itload of nostalgic schlock, but I’ve never seen an Oscar ceremony even approaching the overwhelming, massive, king-size mega-extravaganza that is The Craptacular. If so no one would watch it, and it’s one of the most-watched programs on television. Americans have their own bad taste. I’m not sure if the type of Craptacular that i saw would go over well in the US, aside from some amazement at first, quickly transformed into stone-faced boredom. We just had the annual Royal Variety Performance in the UK – a real, traditional Craptacular if ever there was one. Music, dancing, comedy, cheesy hosts, all for the benefit of a nice old granny. Of course, the ratings for the show aren’t what they used to be. So, while we still have these shows in the UK, they aren’t the sort of mass public essential viewing that is the CNY Craptacular. But then again, we did just have the X-Factor final on the weekend, complete with gospel choirs, celebrities, fake snow, flying on wires, children with candles, and all manner of other cheese. Maybe reality TV talent contests are the new Western Craptacular. Well, I have a slightly different interpretation to offer. My experience in China, especially when I was living in Gansu, was that, despite the rosy rosy things you hear about in the news, a lot of people still don’t have much spending money. Sure, they have more choices. Sure they can afford more things. But they still don’t have a super-high disposable income. 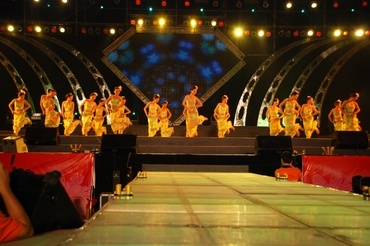 This means that the typical entertainment events that you have grown accustomed to and take for granted (going to the movies, eating in nice restaurants, even renting DVDs (8RMB buys a meal in a Chinese city and two to three in a small town) are not experienced by most Chinese with frequency. This is especially true in second- and third-tier cities and the countryside, where, even if the money were available, the entertainment venues would not be. The only entertainment is the bland TV (which has the occasional, party-sanitised craptaculars too). NOW put this into perspective. Thousands of passersby suddenly find out that there is a carnival going on right outside their home. FREE BIG LOUD SHOW!!!! It’s like a circus in a small town. Of course you would want to go take part… especially if the performances were half-way decent. And since most Chinese still know few forms of mass entertainment besides these craptaculars (any opera, play or major sporting match will be out of their financial range), then of course they would be more willing to put up with some crap to get more of the tacular. My point is this. I agree with you that Chinese are optimistic about the future. But I would not draw this conclusion from a crappy craptacular attended by the masses. Consider first the context of this show in the lives of the people who attended. It simply means more to the common man there than it does to you. On another note, my company’s Christmas party last year was a craptacular. And since the performers were all from the company, the performances really were crappy. And they didn’t even serve alcohol to numb the pain! Of course, the show was ONLY three hours long, so I guess they figured the brevity of the show justified denying us wine and spirits. Great comment Thomas – thank you. Production values may be better than in China, but South Korean and Japanese TV variety shows, including NHK’s annual “Kohaku” Red-white sing off, are mighty Craptacular. I’d put all Western reality TV in this category, too. AMERICAN IDOL – now that’s craptacular! I was googling “mirror blogger in mainland china” and your site show up top on the list. Slim, I am no fan of American Ido and other reality shows, but do they really meet the criteria for craptcular in terms of scale, which I said is the one factor that distinguishes it from the gauche and/or the shlockey? Bad doesn’t equal craptacular. It is the literally overwhelming size of the whole thing that earns it its marks. raptacular goes on as far as the eye can see and lasts as long as the nervous system can sustain itself and is one endless routine after another at eardrum-breaking volumes (usually with lots of fireworks too, of course). American Idol may be a celebration of the mediocre and it may be overwrought and embarrassingly cheesy. But is it craptacular? I’m not convinced. Italians can do craptacular pretty well too. The San Remo song festival every year with the presenters resuscitated from their brain dead state and given hair grafts is an example. They always drum up some interest by having the press get into the back stage drama and in-fighting. Last year, the female presenter got angry about waiting 20 minutes before being brought on and berated her co-host on air: great tv! I like Thomas’ comment the most. Good questions from Richard. I am beginning to get the picture(or do I?) The thing is a lot of us enjoy watching bad shows, they entertain the child in us. Some don’t know the difference while others go only for the artsy-fartsy “master pieces” of crap. I plea guilty to all three. Would Disney World/Land, Britney Spear’s and all the Woodstock wannabe concerts meet the Spectacularly crappy & cheesy show criteria? Another funny thing about people, the French are the masters of the aesthetics, good taste and huffs and yet they make some pretty crappy cheesy movies that were box office hits, while my 2 favorite movie makers like Woody Allan & Roman Polanski who are both cheesy pedophiliacs , yet they make some pretty high brow arty-farty goodies. Am I still on topic? Perhaps I’d better stop here. I attended a craptacular in Beijing organised by the company Amway a few years ago, and found it highly entertaining, but not for the right reasons. One thing I found strange was that when I was asked to go it was described to me as a party (Íí»á,wanhui) – obviously v different the western idea of what a party is. While I agree that it is warming to see the audience so happy, I can’t help feeling that it’s quite shallow at the same time, everyone acting as one big mass enjoying so much what is quite crass entertainment, banging together their inflateable “pongbong” sticks. I also find it upsetting that having gained economic freedom, so many Chinese have lost interest in their political freedom. The political situation means that it is difficult for entertainment in China to be thought provoking – as hunxuer says, perhaps this is the new opiate of the masses, or one of them at least…. karibdis, I share the sadness at seeing an entire generation that doesn’t care that much about political freedom. Virtually every friend I have here, including my colleagues, tell me how much they dislike the government. And yet they are all content to accept it and get on with their lives. Some of these same people speak with a near-religious fervor about the central government’s ability to basically do whatever it wants, like control the weather, clear away traffic when necessary, make sure everyone can eat, etc. They see the government as omnipotent, and the idea of protest as absurd, since it would only lead to your own destruction, and besides, most people in the cities are making money so why rock the boat? Back to Craptaculars. I think we need to draw a line between tastelessness (which covers about 80 percent of American television), flashiness (a defining characteristic of most events/galas on TV, like the Oscars, MTV awards, etc.) and the Craptacular. As I said, Craptacular has to be experienced to be understood. It makes you feel impossibly small and insignificant, a droplet in the Pacific Ocean. Your senses are overwhelmed on every front and you have no choice but to experience amazement, disorientation, followed by some boredom as the same thing basically repeats itself, hour after hour after hour after hour. Craptacular, at least when experienced live and in person, is a physical assault on the senses, kind of like being at a huge rock concert, only with an endless parade of performers, some of them pretty awful (and some quite excellent, as noted in my post). What’s noteworthy too is the superficiality of it – you are bowled over by the size, by the scale, but there isn’t much connection with the performers; it’s one flashing image after another, leaving behind a surreal blur and the question, Did I really just experience what I think I did? The good old Romans already knew how to do it. But for what I see at the photos the set up look spectacular and the people really seems to enjoy it. It seems also the performers are not so bad after all and….. Man! It is free as in Beer!! Take it easy. There is a time for everything, what will come will eventually come. I said that along with the boredom, it was also wonderful, unforgettable, amazing, and I said I loved the people in the crowd who were loving every instant. What they know as entertainment is very different from what I know as entertainment, so I realize we see things through our own filter. Exactly. Different strokes for different folks. What I would like to see on TV are CIVIC EDUCATION ads or promos on (against) Line Jumping, ceaseless honking, spitting, littering etc…. I dunno the statistics but I remember perhaps 40 years ago, HK was no better than SZ today in terms of the lack of good public manners. It is only thanks to the HK government’s tireless efforts in promoting public civility over the decades (and the establishment of the HK ICAC. ) that HK is comparatively much better in this respect. But I’m afraid I’m not so sure how well or badly HK’s brands of craptaculars compare though. I beg your pardon, I meant to say, What I would like to see on CCTV are CIVIC EDUCATION ads or promos on (against) Line Jumping, ceaseless honking, spitting, littering etc…. I guess the Olympics opening ceremony in Beijing next year will take the craptacular to a new level. there’s a show called “bollywood temptation”, mostly performed in cities like mumbai or bangalore (though it is staged worldwide), which i suspect reaches a similar degree of craptacular. here in germany, we haven’t had much craptacular since the 1940s. Now, the ultimate craptacular must be the North Korean Mass Games. American Idol may be a celebration of the mediocre and it may be overwrought and embarrassingly cheesy. But is it craptacular? I’m not convinced. Maybe the Musikantenstadl qualifies as craptacular? Whats the meaning behind “craptacular” culture? Its the party’s wish to zombify the masses, as always. You may think propaganda only looks like political ideology, but hey theres also the option of promoting brainlessness which is the ultimate goal, making the Chinese people into absolute 100% tools for the party, so I think “craptacular” culture is the culture to make the Chinese people empty of anything meaningful that might promote human dignity, which the party is fundamentally opposed to allowing. naah, musikantenstadl is way too cute to fulfil the criteria of craptitude, though i admit it has elements of craptacular in it. Well, you have to imagine a person who doesn’t understand German watching it. And have you realized that Florian Silbereisen looks like a German version of Li Yang, or the other way round? florian silbereisen is unique! no one, i repeat: NO ONE looks quite like him! not even li yang. You are right, he is unique and nobody really looks like him, but I’d say there are certain similarities like a similar haircut, the same flashy suits, don’t you think? Anyway, if I had a choice, I would go for Li Yang. What do you think? It’s pretty terrible. Humor in China is also awful. Things like this have a history of being replaced or improved by market forces though. Humor in China can be very dangerous. The problem is not that Chinese people have a bad sense of humor, the problem is that the CCP pigs have no sense of humor at all.